I snuck in another super-sunshiney Centaurée while we’re having a last hurrah of summer here in London! This version uses quilting cotton from the September Blue range by Dashwood Studio, available at M is For Make. 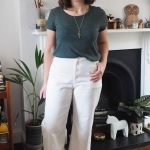 David of Dashwood (who incidentally is a client of mine in the day job – I designed the Dashwood logo and website) kindly sent me the fabric to introduce this new range, which excitingly for dressmakers also includes two designs in lighter dress-weight cotton lawn. I like to think this was partly my doing as I’ve been nudging him to go into dress fabrics! 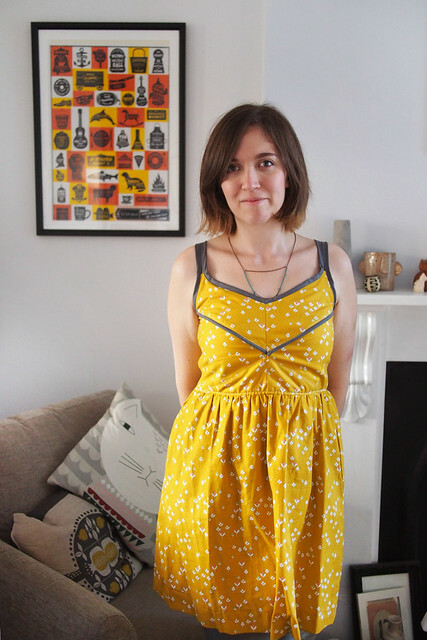 I used the regular quilting weight for this dress as I knew Centaurée worked in a heavier fabric and I fancied this mustard yellow ditsy print. This time I decided to try piping the upper bodice seams. I only had rather thick cording to hand so it looks a bit too chunky and I didn’t quite get the middle lined up perfectly, but I like the effect anyway. 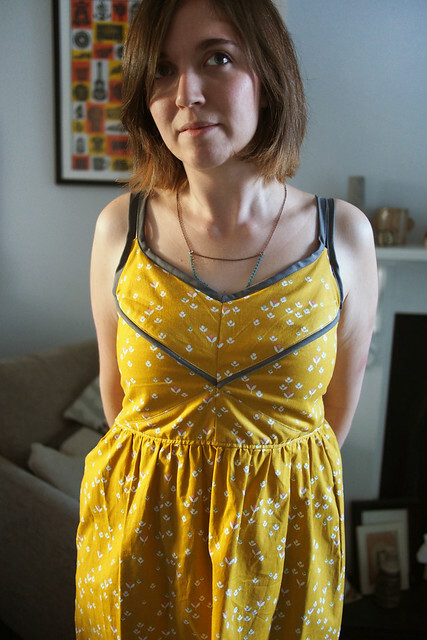 I used the same grey bias for the edging and straps, which I think makes the bright yellow a bit more graphic and wearable. Weirdly I have a some diagonal wrinkling across the lower torso on this version, almost like it’s too baggy round the ribs. It could be that I didn’t line up the bodice and lining quite perfectly so it’s tugging a bit. I fully lined the bodice in the regular way this time, by making a copy of the exterior in a lightweight cotton and basting them RS together. I gathered the skirt like I usually do, with thin elastic which then stays in the dress and acts as a kind of waist stay. Finally, the instructions have you sew the binding right over the top of the zip, connecting the front and back at the top, but for this version I stopped and restarted the binding as I find it a bit tricky to get in and out of my other Centaurée! I guess this will get tucked away for the cold weather soon, but I’ve just booked a holiday to Mexico next month so it may well see an outing then. I’m dead keen to try drafting a Centaurée-style panelled bodice but with sleeves too… watch this space. Fabric for this make supplied by Dashwood Studio. This is gorgeous! I love the yellow with grey highlights – so pretty! I LOVE this colour, and especially on you! Fabulous! 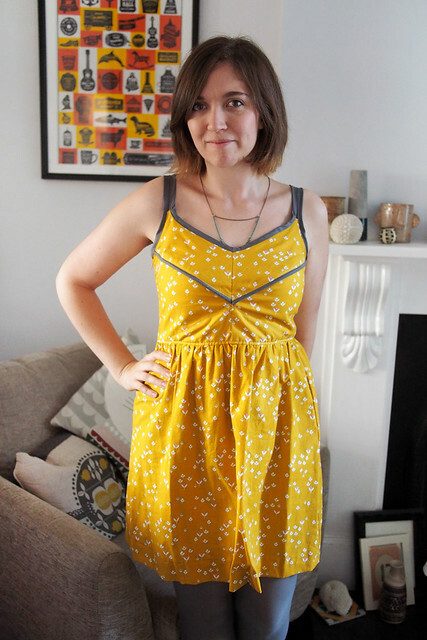 Such a pretty dress, love the effect of the bias binding across the bodice, the grey contrasts perfectly with the mustard! such a happy colour ;o) I love how you used the piping. I didn’t even notice the wrinkling until you pointed it out, as it seems to follow the centauree bodice lines anyway! Stunning! I haven’t seen a version like this before, with just the two seams highlighted. So pretty! what lovely fabric!! the yellow and grey are really complimentary, and I love the way you added piping to really make those style lines pop! Great dress!! Surely this is the perfect colour for winter!? Thrown over or under thin layering with tights or leggings & fabulous boots; it will be the blast of sunshine needed on a grey drizzling winter’s day. Keep it out! Fab colour choice & lovely front detail. Well done you. True, as you can see I’m wearing it with tights here so it could definitely work! Wow that colour is perfect for catching the last rays of our summer sunshine…loving your blog too…so a Big Hello from me to you!! Love the dress and your blog. I am wondering if the wrinkling might be due to lack of breast support. It looks like there is a bit of wrinkling on the top also, and it makes me think that maybe the widest part of the breast is designed to be a bit higher. Maybe some sewn in cups and a bit of boning would help the fit. Fabulous dress though. I love the grey piping with that yellow. I’m wearing a bra underneath! But yes, something in the shaping isn’t right this time. This is so cute! 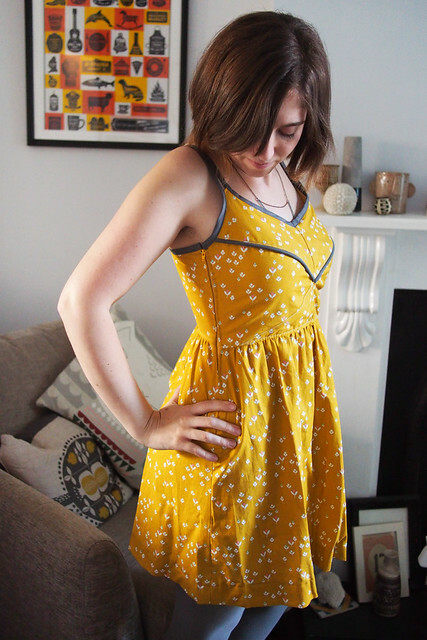 I love the yellow with the grey—totally matches well with your grey tights. 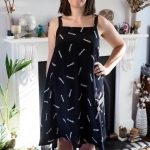 I didn’t end up making this dress this summer because I didn’t think it could move well into Fall, but it seems like you’ve kinda got it down. Plus Mexico, definitely will work well for that trip! A sleeve version sounds ace. I never managed to make my summer centaure, but soon. it’s such a lovely dress. Oh I just love the pattern. Simple yet lovely. The fabric choice was good too. It looks good with your gray tights. 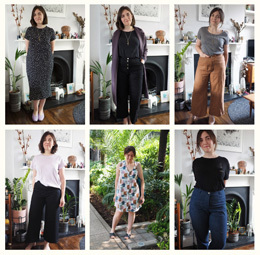 Thank you for sharing this awesome sewing pattern. I hope to see more great dress patterns in the future. Kudos!